Have you checked your trees for signs of invasive pests? Insects like the Asian Longhorned Beetle and the Emerald Ash Borer threaten trees across Massachusetts. We encourage everyone to take a few minutes to check trees in their yard - or in nearby parks or forests - and to report any suspicious tree damage. Learn how to recognize the signs of Asian Longhorned Beetle (ALB) and Emerald Ash Borer (EAB) damage, and report possible sightings. The most easily recognizable ALB tree damage is the perfectly round exit hole (a bit smaller than a dime) that the adult beetle makes when it bores out of the tree. Female beetles make small divots in the bark of the tree when they lay eggs. Keep an eye out for “frass,” a sawdust-like material excreted by larvae and adults as they chew their way through the wood. The common host trees for ALB are maple, elm, willow, birch, and horse chestnut, ash, poplar and several other hardwood trees. ALB does not attack oak, fruit trees or softwoods (conifers like pine, fir and spruce). 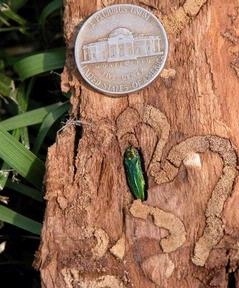 Another foe of trees that threaten Massachusetts trees is the Emerald Ash Borer. EAB only attacks ash trees, which are commonly planted as street trees or shade trees. The first confirmed find of EAB in Massachusetts was in August 2012, and as of July 2016, have recently been confirmed as far east as Newton. EAB cannot be eradicated and is expected to spread much further and faster than ALB, potentially leaving thousands of dead ash trees in its wake. Through early detection, we hope to slow the spread of this pest. The damage caused by EAB can kill an ash tree in just a few years. Rather than boring into the heartwood of the tree like ALB, EAB larvae tunnel directly under the bark, creating S-shaped galleries that quickly cut off a tree’s nutrient and water supply. When an EAB reaches adulthood and bores its way out of the tree, leaving a small D-shaped exit hole about 1/4” in diameter. Other signs of EAB include loss of foliage of the upper third of the tree’s canopy, increased woodpecker activity, and the presence of small branches that emerge in shrub-like bunches below the dead parts of the tree. Know what to look for: Emerald Ash Borer and Asian Longhorned Beetle are devastating invasive pests. Take ten minutes and survey your own property for signs of both beetles. Organize a talk and/or survey for a local group or organization in your area. Buy firewood only where you intend to burn it, and chip wood onsite following yard work or storm cleanup. Don’t move wood long distances because you could be accidentally spreading pests. Because the Emerald Ash Borer and Asian Longhorned Beetle (ALB) are active this time of year, it can be easier to spot it or the signs of these beetles. Take a 10-minute walk around your yard or neighborhood and inspect your trees. If you see any signs, report them here.